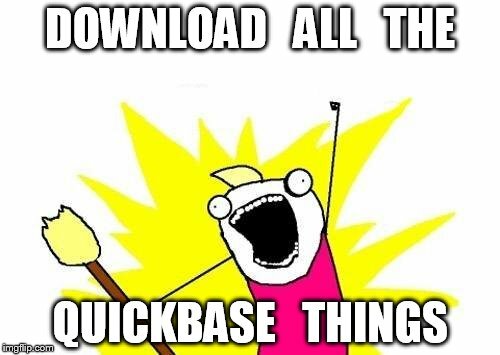 Yo Dawg - how do "Download All The Things" your QuickBase? I am a little confused by you reference to "all the things." complexity. If that is your question the answer is resoundingly yes! happens to contain the information we want access to (the table names and dbid's). That's fantastic but how do you download all the great information in gTableInfo to your local disk? Amazingly this will convert the object gTableInfo to JSON and save it to the file gTableInfo.json! Attached are four screenshots of the the process described above along with an edit of report.csv in Excel.